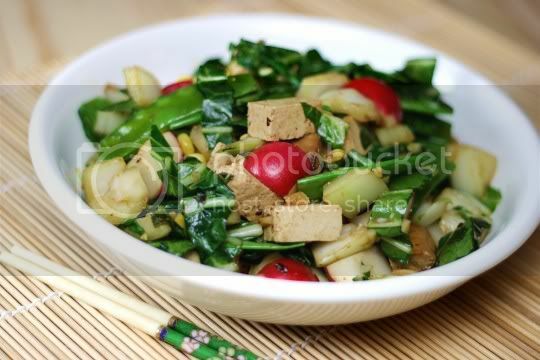 It seems as if the kitchen sink of vegetables is in this unique Asian dish. 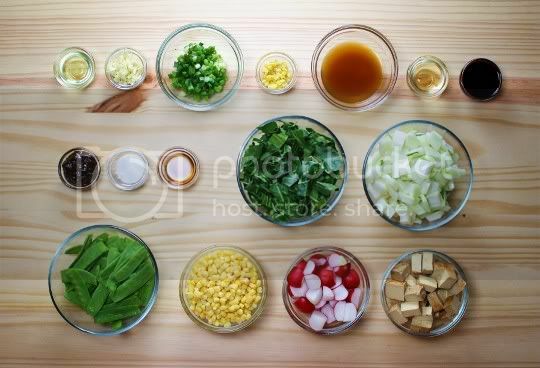 There's a little of everything: garlic, green onions, bok choy, snow peas, corn, radishes... 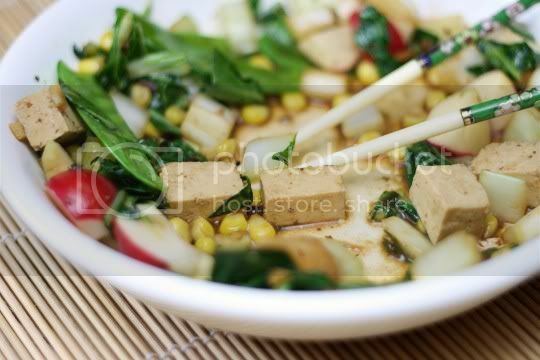 Wait, corn and radishes in an Asian stir-fry? Yep, you read right, and surprisingly, it works! This dish is pretty easy to make...well, once all of the veggie prep is out of the way. And yes, there's a lot. You have to mince the garlic, green onions, and ginger. You have to clean the bok choy, and then shred the leaves and dice the stalks. You have to string about half a pound of snow peas; wash, trim, and quarter radishes; and dice pre-baked tofu. Thank goodness fresh corn shucking isn't required, ha! But once all that's done, each of the few recipe steps is only about 1-2 minutes long. For the delicious stir-fry sauce, start by sauteeing the garlic, green onions, and ginger. Next, add vegetable broth, dry sherry, soy sauce, black bean sauce, sugar, and sesame oil; bring to a simmer, then set aside. The finished dish is surprisingly amazing. The sauce and veggies are perfectly cooked, and all of the flavors work so well together. Each bite is a crunchy, juicy mouthful that's just bursting with sweet, salty, and tangy. Even the corn and radishes--which I originally scoffed at--fit: the corn adds mini bursts of sweetness, and the radishes add this amazing pungent spiciness, almost like a mild hint of wasabi. The bok choy takes two roles: the stalks are mild, sweet, and buttery; and the leaves are bitter and slightly acidic. Although "gingered" is in the name of the recipe, I really didn't taste much at all. It did add some noticeable gingery flavor, but it wasn't overwhelming. The tofu provides a nice break from the crunchiness of all the veggies, and the already Teriyaki-flavored variety absorbs the sauce so well. My only complaint (and it's a minor one) is that the size of the snow peas in relation to the other veggies makes them a little hard to eat. I'd suggest cutting them in half, or maybe even a big dice, just so you can easily grab everything in one forkful. Anyway, back to that glorious, glorious sauce. Seriously, you might want to just use this as your standard stir-fry sauce, adding whatever veggies you desire. Most of the ingredients are standard, but you'll want to keep a jar of black bean sauce on hand just for this! It's the perfect blend of salty and sweet, with lots of garlicky flavor. Make again? Yes. There are so many delicious flavors going on, you can't really just taste one thing...which probably makes this good for picky eaters, vegetable haters, or kids! The images al also wonderful. I love it, so many different ingredients and colors. I use tofu often and stir fry is my favourite. I will sure try your recipe. Thanks!